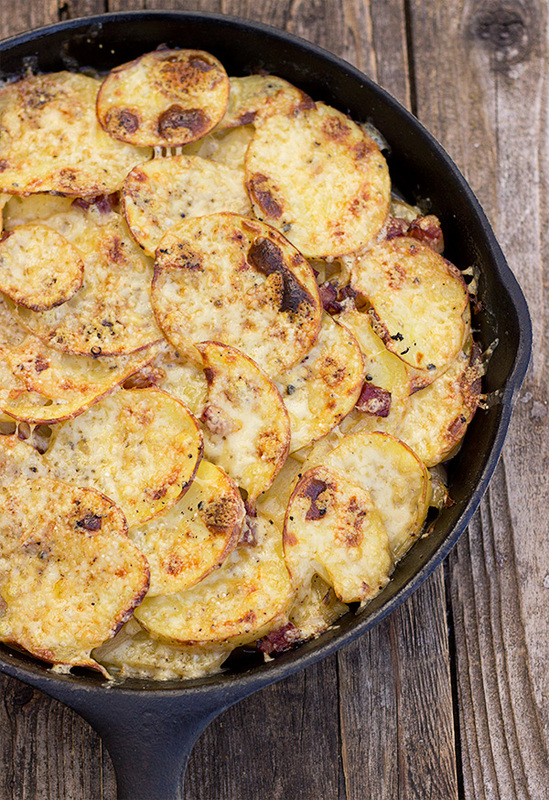 These Irish Pan Haggerty Potatoes feature sliced potatoes, bacon and sauteed Onions, topped with Dubliner Cheese. Great Irish comfort food. Over time, I’ve taken to cooking up the Pan Haggerty. This is my version – potatoes, cooked to creamy goodness in a bit of chicken stock, layered with crispy bacon bits and sauteed onion and topped off with a generous layer of melted Dubliner cheese. It takes a little extra time to cook up the bacon and onions, but I think it’s well worth it. If you’re feeling lazy, it’s perfectly fine to just layer some finely diced (uncooked) onion with the potatoes and skip the bacon, if you like. The potatoes in this dish cook covered on the stove-top. My skillet doesn’t have a lid, so I just cover it with foil. It takes about 20 minutes. Since I can’t seem to pass up an opportunity to have some crispy potato bits, my dish then makes a trip to the oven to crisp up a bit under the broiler before I put the cheese. Once they top potatoes have browned, I add a generous layer of Dubliner and put it back under the broiler until it’s bubbly and browned. The amount of chicken stock you put in to your potatoes will vary slightly with the size of your pan. My 8-inch skillet takes a bit over a cup. The exact amount is not critical though. You want to add enough to cover the bottom of the pan to cook the potatoes, but if you add too much and you have a bit of stock left in the bottom of the pan when it’s done and you cut it, simply spoon it off and you’re good to go. Obviously you can use whatever kind of cheese you like on top of this dish, but honestly, Dubliner is hard to beat. What ever cheese you pick, go for something that has enough flavour to hold it’s own – an aged cheddar, Swiss, Gruyere, Asiago etc. Another nice variation is to increase the amount of onion and to caramelized them by cooking them longer. This is especially nice when it’s served as a side with dinner. 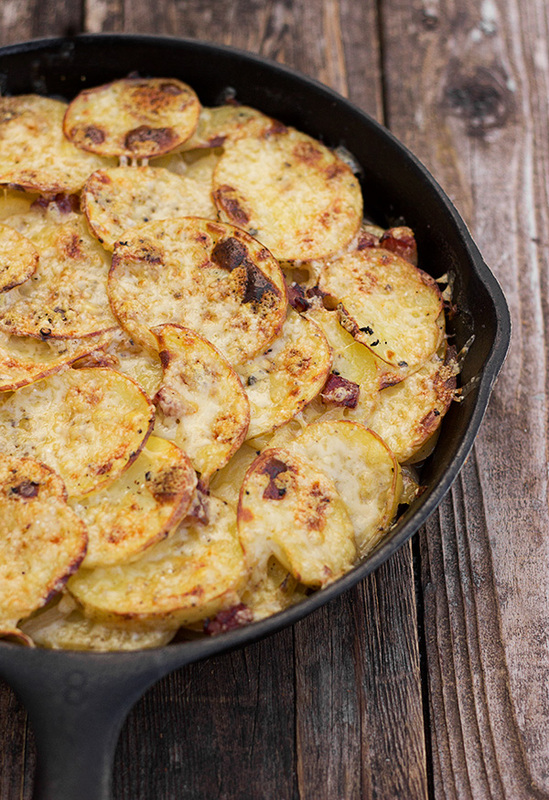 As well, sprinkling a little extra cheese with the layers of potatoes would never be a bad thing. As for the potatoes, I used Yukon Gold (yellow-fleshed potatoes) in this one. White potatoes are great, as well. I don’t suggest Russets, as they don’t tend to hold up as well. Pan Haggerty is a great side-dish for dinner or next to some eggs for a weekend breakfast (or breakfast for dinner). Of course, it’s also perfectly acceptable to just sit down with a bowl of it all on it’s own. 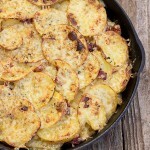 Potatoes, layered with crispy bacon and caramelized onions, topped off with a generous layer of melted cheese. I love Dubliner cheese, or try Swiss, Asiago, Gruyere or an aged cheddar. White potatoes or yellow-fleshed potatoes are great for this dish. In an oven-proof skillet over medium heat, heat a small amount of oil or butter over medium heat and add the onions and a pinch of white sugar. Cook, stirring often, until onions are golden, about 10 minutes. Remove from pan and place in a small bowl. In the same pan, fry the bacon until browned and slightly crisp. Remove from the pan and combine in the bowl with the reserved onion. In the same pan used to cook the bacon, arrange a layer of the sliced potatoes in the bottom of the pan. Sprinkle with 1/3 of the onion/bacon mixture. Add another layer of potatoes and another 1/3 of the bacon/onion mixture. Season lightly with salt and pepper (remember the chicken stock will add some salt to this dish, as well). Add another layer of potatoes and the final 1/3 of the onion/bacon mixture. Top with a final layer of potatoes. Pour about a cup of chicken stock over the potatoes. The goal is to cover the bottom and come up the sides just a bit. You may need a bit more than a cup if your skillet is larger. Increase the heat to medium high and bring the stock to a boil. Cover the pan with a lid or a piece of tin foil and reduce the heat to a low. Simmer for 15-20 minutes, or until the potatoes are tender (test by inserting a sharp knife into it. It should pass easily, without resistance..
Heat your oven broiler with the rack in the top position. 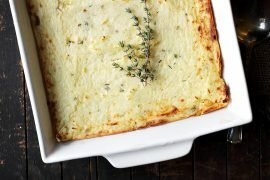 Uncover the pan and place the skillet under the broiler for about 5 minutes, or until the top potatoes have browned. Remove and top with grated cheese. Return to the broiler and heat until cheese is melted and browned, about 5 minutes more. To serve, cut wedges from the pan. (If you have any excess stock left in the bottom of the pan, simply spoon it off). I made these today and we loved them. Great for company. So glad you enjoyed them, Shirley :) Thanks! This has just come out of the oven and it looks and smells heavenly! Thank you! Looks absolutely gorgeous! We have a very similar potato dish in our family, it’s Russian in origin and layered with mushrooms, onions and sour cream of course! Your Russian version sounds delicious! You can never go wrong with potatoes. 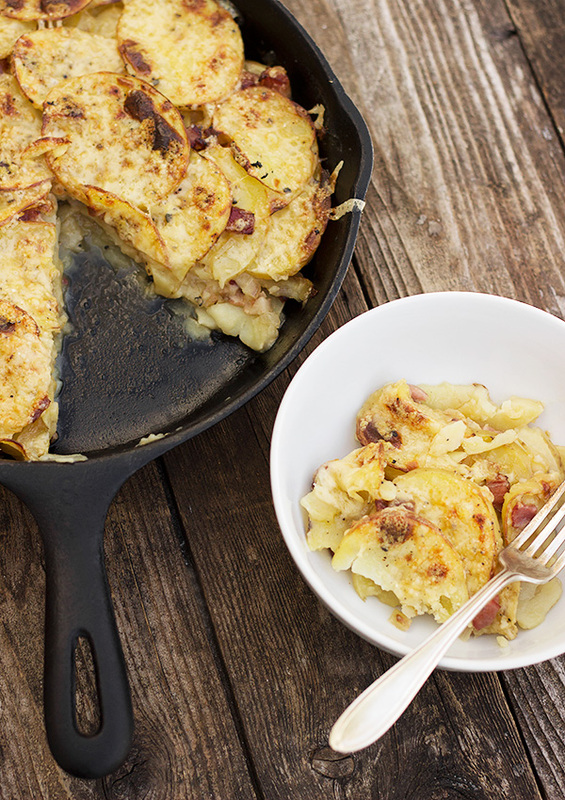 Crispy AND creamy — always the best way to enjoy potatoes! This looks so GOOD and I love the story behind it from your early years :) Precious. Thanks Sophie. I wish I could say my husband’s repertoire of food dishes have increased, but I’m not sure that would be true. He’s really good at meat. Just meat – a pork chop or a steak. Just not much of a multi-tasker, so no sides ;) I guess that’s why I took over the cooking duties in this marriage! YUM! This looks so good. 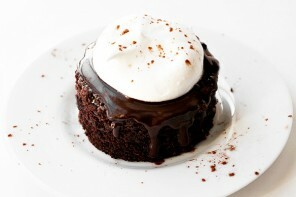 I’m so hungry right now and I can’t stop looking at your photo and think about eating it.. Definitely going to try your recipe! 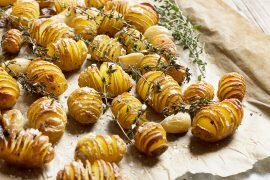 What a comforting dish, I love how crispy your potatoes look! Thanks Laura. I have a weakness for crispy potatoes. This looks delicious… would be the perfect side dish to a grilled pork tenderloin. I just wonder why on step 3 of your instructions you mention carrots! ps: I enjoy every single one of your recipes (and photos)… keep up the great work.